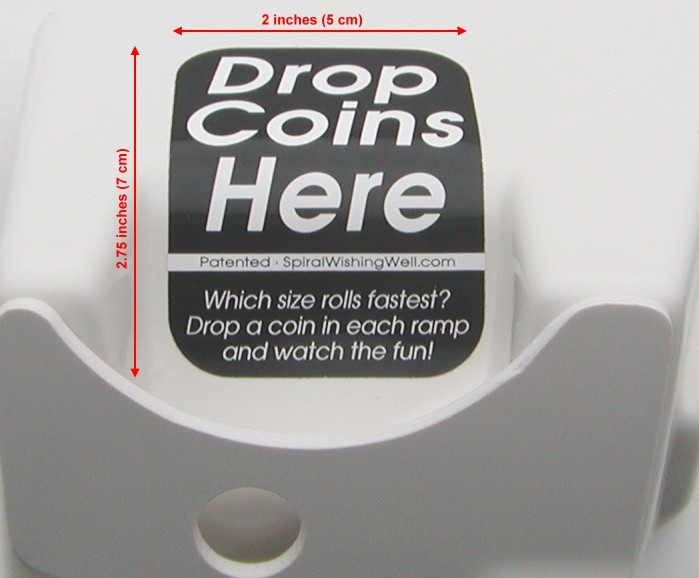 Click here to see close-up pictures of the ramps, funnel, base, sign, and stickers. 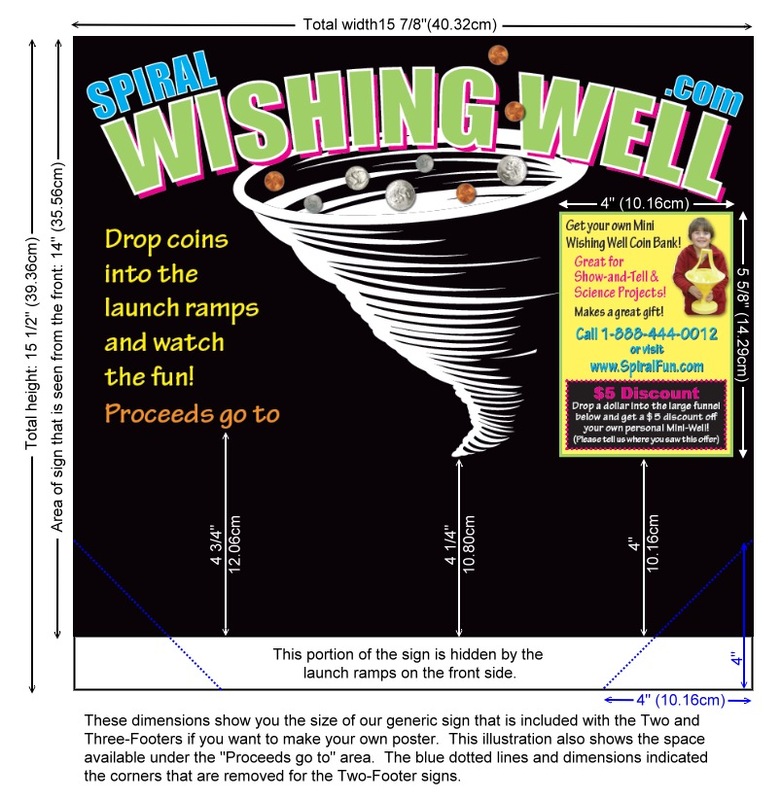 Spiral Wishing Wells are very durable. They have no moving parts and will never wear out under normal usage. The only incidents of breakage have been rare, usually caused by vandalism or in one case, being dropped off the back of a truck. If a part ever breaks, you can get a replacement "at cost" if you purchased your Well directly from us. Can the new ramps be retro-fitted to the older models? Unfortunately they cannot. We have had several minor model changes over the years. (Click here to see pictures of the older models.) Previously, it was possible for new version parts to be retrofitted to older models. 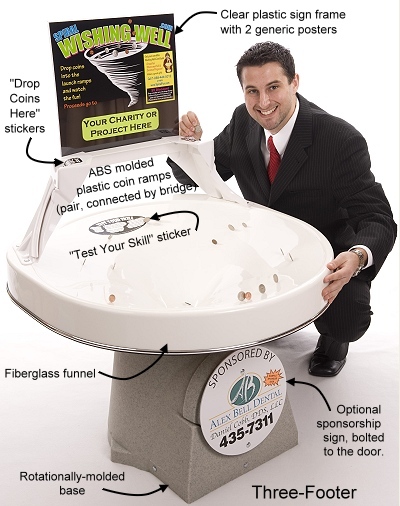 But the new models (Three-Footer shown above) are a major re-design with the ramps mounted "outside" the funnel to yield more coin-rolling surface, wider spirals, and more visibility. So the new coin-ramps cannot be retrofitted to the older "round" funnels, and we don't have any more of the older round-model ramps. Therefore, if you need new ramps, you will also need to purchase a new funnel which will bring you up-to-date with the latest and best. A more complete review of the new features can be seen here. The new design integrates the bridge and ramps together, so there is no need to purchase an additional bridge to connect the ramps as was necessary with the older models. 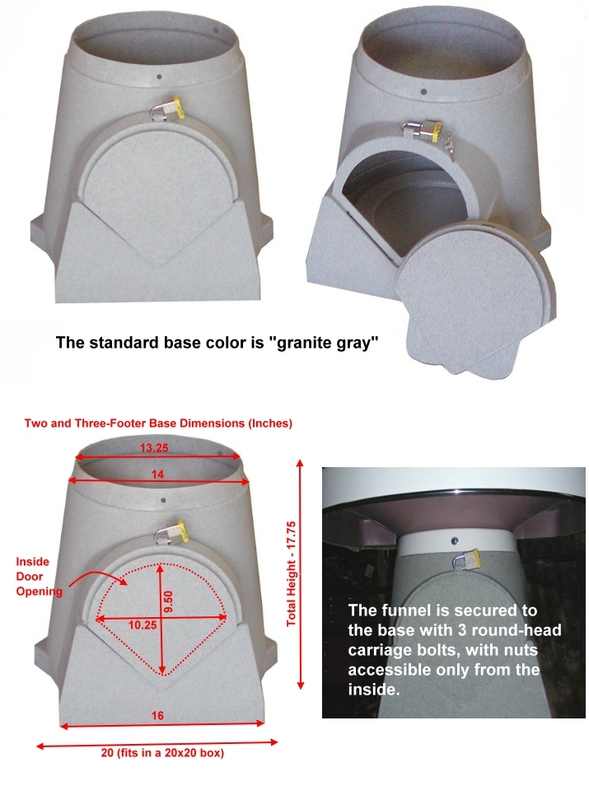 The new base has the same top-diameter as the previous model base, so the new funnel can be retro-fitted to the previous version of rotationally-molded base if you don't want to upgrade your base. However, the new bases are more stable (20" bottom rather than the previous 18") and the door is much easier to access and remove, so you might want to consider a new base. See parts descriptions on the picture of the Three-Footer above and/or click on the links for larger views. Since the Seven-Footer does not have separate parts for the Well, none are listed here. Click here for Seven-Footer sign options. NOTE: Parts prices are "at cost" and only available to those who are replacing parts on existing Wells purchased directly from us. You cannot purchase parts to make up a new Well. Let us know which part(s) you need, and we will quote the shipping cost to you. Padlock: If you only need a replacement padlock, we recommend that you purchase it locally as that will be less than the shipping cost from us. A 1 3/4" or 2" padlock will work. Please call or email for parts shipping costs.